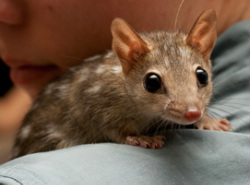 Our conservation work on northern quolls was featured in Attenborough's Ark. Needless to say this is a career highlight! Our northern quoll research was featured on the iconic Australian comic strip, First dog on the Moon. This is certainly another career highlight! Unlike most reptiles that dig their own nests in the soil, velvet geckos lay their eggs in communal nests inside rock crevices. In the southern part of the species range, communal nests are located in full sun, and consequently, there is a very high correlation between ambient air temperatures and nest temperatures. During summer heatwaves, eggs can experience high temperatures. 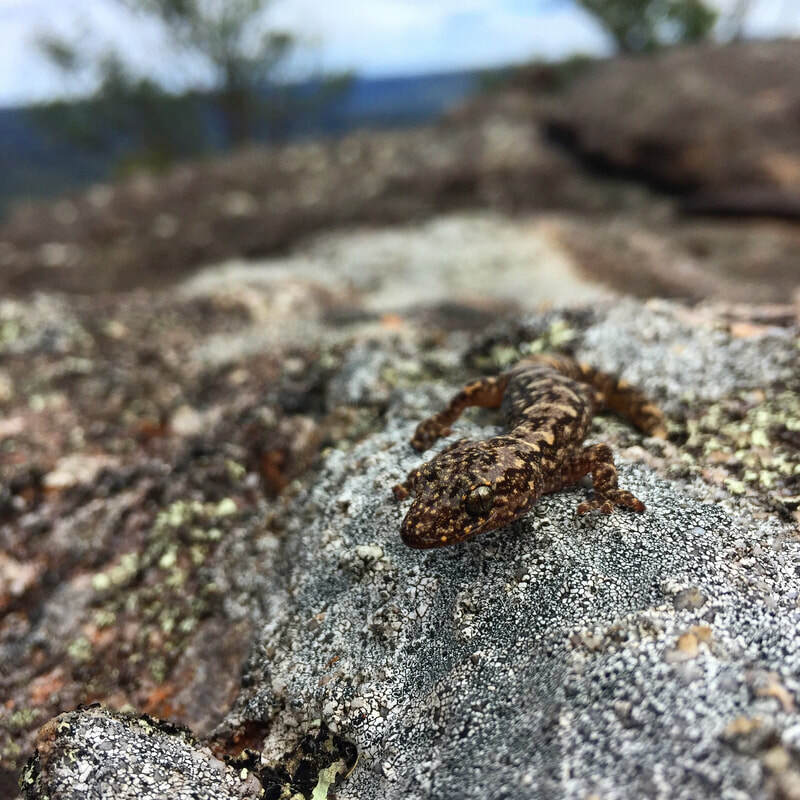 To investigate how future increases in nest temperatures could affect gecko populations, we incubated gecko eggs under temperatures that mimicked current temperatures, and future temperatures likely to be experienced in communal nests in 2050. We found that hatchlings from the future-temperature treatment were smaller, and had lower survival, than hatchlings from current-temperature incubation treatment. Population viability analyses showed that unless females change their nesting tactics, geckos populations are more likely to go extinct in the future. Will females avert this catastrophe by choosing more suitable egg-laying sites? Unfortunately, we've not seen any evidence that females have altered their nesting choices over the last 26 years to keep pace with rising temperatures. This is a little concerning! Stay tuned. 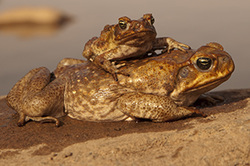 Cane toads recently invaded desert regions of Australia. How do cane toads survive in this hot, dry, semi-arid landscape? Honours student Daniel Florance radio-tracked adult toads and discovered that adult toads have to soak in farm dams every 3 days to survive. Hence, the provision of artificial water (bore-fed dams) for grazing livestock has enabled toads to survive in arid regions of Australia. By restricting the toads' access to these artificial water sources, we eradicated cane toads from a large area. 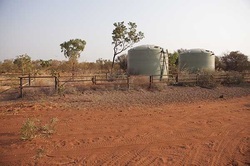 We showed that a simple method - replacing earthen dams with plastic water tanks - could prevent cane toads from invading the Pilbara region of Western Australia. Keeping the Pilbara toad-free would have enormous conservation and cultural benefits. How do young, male lizards desperate to mate, access females and avoid attack from older males? We found that young young male Augrabies flat lizards (Platysaurus broadleyi) hide their colours so as to imitate plain, brown females. Imitating a female allows the juvenile lizards to mate with females, without being detected and driven away by the larger, territorial, adult males, who will chase and bite their young rivals. 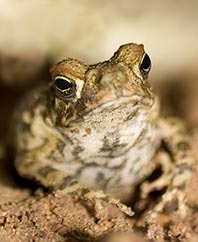 Adult cane toads are usually active at night. However, they have radically altered their activity patterns to survive in arid Australia. We used acoustic fish tags, like the one attached to this toad, to discover how often toads visited farm dams to rehydrate near the Tanami Desert. Amazingly, cane toads made most visits to the water during the day time! The toads' extraordinarily plastic behaviour has allowed them to colonise one of Australia's most hostile environments, and explains why they are one of the world's most successful invasive species. The Northern Quoll's taste for cane toads isn't helping its chances of survival. To wean them off this deadly diet, we used conditioned taste aversion to train captive bred quolls not to eat cane toads. Following release to the wild, 'toad smart' quolls had much higher survival than 'toad naive' quolls. Reintroducing 'toad smart' quolls could help to bring quolls back to areas where they are locally extinct, but this will only work if we can mitigate other threatening processes, such as inappropriate fire regimes and predation. Cane toads (Rhinella marina) are highly toxic invaders that were deliberately introduced to Australia in 1935. Since then, they have spread across much of northern Australia. Recently, toads invaded the fringes of the Tanami Desert, one of the most inhospitable places on the planet. We manipulated toad stress hormones to find out how they cope with high temperatures and desiccation stress.